A social media campaign by Wieden and Kennedy will see Coca Cola polar bears reacting live to in-game events during this year’s Superbowl on 5th Feb, with each supporting a separate team. The campaign will stream via Facebook, where just simply RSVPing raises money for the World Wildlife Fund – find that here: the Coke Polar Bowl – and reactions will also be posted on Twitter (#gamedaypolarbears). On Feb. 5, the Polar Bears are throwing their first-ever Coca-Cola® Polar Bowl Party. They’ll be watching the game and chatting with friends from kick off until the clock runs out. RSVP now to hang out and chat with the Polar Bears during the game. 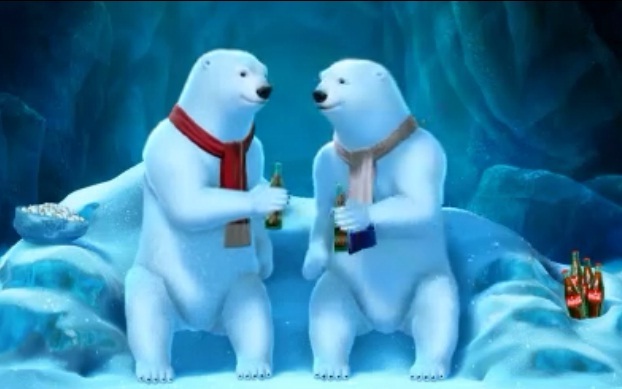 Plus, with each RSVP Coca-Cola will donate $1 to World Wildlife Fund to help polar bears and their Arctic home. The campaign will also include TV, online, print and poster ads. Read more about the campaign here on The Drum. How does a polar bear stop a VCR? What are white, furry, and have wheels on their paws? Thanks very much, I’m here all day.